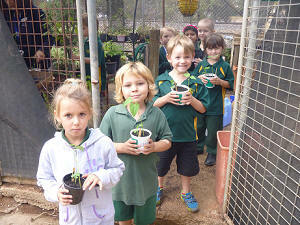 :: Red Cliffs Primary School serves a rural town (population 2500) and surrounding outlying communities. It is situated in a rural fruit growing area on approximately 2.9 hectares and has a student population of 191. Pupils are drawn from a mixture of town and farming families whose economic situations vary widely. :: There are 24 teaching & ancillary staff. :: Our school is committed to whole school planning and evaluation processes and promotes the principles of open consultation and democratic decision-making. The School Council, in partnership with the school community, aims to promote and provide the best possible educational opportunities for all students. We aim to develop a successful partnership between students, staff and parents, which will help all students realise their potential. Children are encouraged to "Do Better Today than Yesterday", to take pride in their work, show respect for fellow students and develop self discipline practices which foster self esteem, self confidence and tolerance. 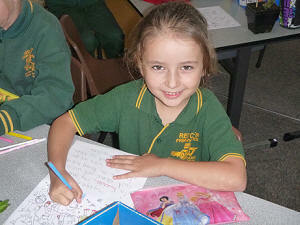 :: School programs emphasise the students' literacy and numeracy. A comprehensive curriculum in the Key Learning Areas of English, Mathematics, Science, Studies of Society and Environment, Health and Physical Education and the Arts is provided. The development of Learning Technologies is a high priority. All classrooms have Interactive White Boards and computers for student use. The school has a modern computer lab of 28 computers in addition to each grade 5/6 student having access to Student Netbooks. A Reading Recovery Program is provided at Year 1 level and programs to help cater for students identified as having special needs and talents are planned and delivered by staff. The Early Years Literacy Program is operative with a daily two-hour literacy block timetabled across the Infant Department. The two hour literacy block is extended throughout the school. :: Well-documented policy statements support programs. Curriculum evaluation is part of an ongoing process as established and outlined in our Whole School Plan. :: Reporting processes are well established and a range of assessment strategies are used to compile profiles of students' learning. Written reports, three-way student led conferences, informal discussions, weekly newsletters and information evenings ensure ongoing communication with members of the school community. :: Special facilities include a Multi Purpose Room, Art / Craft Room, a fully computerised Library, Computer Room and a Science complex including a Science Room and an outside Environmental Studies area. Special programs that complement our Key Learning Areas are the Red Cliffs Lunarfest, Kids on Bikes, School Welfare Officer, Inter-school Sport, Special Forever and visiting performers. :: Grounds are excellently presented and maintained and a variety of play areas and equipment provide a functional, relaxing atmosphere for student learning and play. :: The School Council and Parents' Club are very supportive and enjoy a positive working relationship with staff. Both bodies have regular input into policy development, resource purchases, maintenance and grounds development. :: The principles of consultation and negotiation are key components in their operation. An "open door" policy ensures communication channels are continually available to all members of the school and wider community. :: The school community is committed to its ownership of the school, to fostering its development as a self-managing unit and to providing a curriculum which is inclusive of all students. :: The school's aim is to provide quality curriculum programs in the Key Learning Areas, with continued emphasis being placed on the development of literacy, numeracy and learning technology skills. Teachers and members of the school community are committed to providing a physical environment which is functional, attractive, safe and stimulating, and to develop in all students positive attitudes to learning, respect and courtesy for self and others and the enhancement of self esteem.